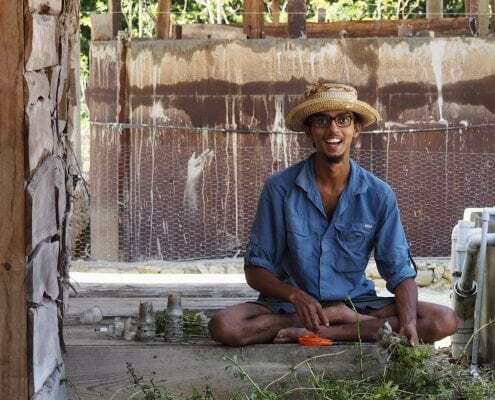 Taino Farm is a developing farm rapidly moving towards self sufficiency. Our internships are intensive hands on experience. You get out what you put into them, meaning that the more you dive in, the more you learn. The staff that manage the systems daily are happy to offer guidance , and there is a wealth of knowledge from previous mentors and interns available to learn from. Interns are also encourage to collaborate on existing projects. Projects that interns are immediately tasked with are farm tours , blogging, daily system maintenance, harvests and and the production of value-added products like fermented foods, preserves, hot sauce, honey, dried products. Please note, much of your interaction will be with Spanish speaking people of Los Brazos during your stay. We encourage the development of a sense of community, camaraderie, helping to cook together, getting to know our neighbors, taking on new projects and exploring creative homesteading ideas. We encourage you to get offline, get outside and read a book instead! Our internet source is sometimes what we call “survival internet”, so no streaming and no video. Interns are encouraged to find practical solutions to challenges, both environmental and social. It is important that people keep an open mind and see the positives in others, offer assistance to those that that might be struggling. Interns are encouraged to take responsibility for their own state of mind, and must be open and honest with themselves and others, ‘Be the change you want to see’. The farming week is Monday to Saturday and farm hours vary depending on weather and season. sometimes you will be asked to step in on a Sunday to help with tours, other times you will have extra free time during the week, flexibility and openness to a changing schedule is key. We avoid the term ‘work’, because It shouldn’t feel that way, although some times it takes a few days to feel the love and meditation within garden work. There are some tough days, however, that’s a workout in our opinion. It’s always hot in the middle of the day and so we don’t really do much in the field between 11 and 3 but working on things such as personal education, creative projects, photo/video/blogging projects or teaching children in the community, creating music, cooking feasts, and making preserves, is a great way to spend this time. Even on sundays, if you choose not to explore the Island, there is always a staff member around who is happy to work with enthusiastic individuals. There will be nobody cracking the whip during your time at Taino, but as is true in life in general, you get out, what you put in. Working at Taino Farm is a transformative experience and an intensive submersion in to living on a working sustainable farm in the tropics. If ever you’ve thought of homesteading, this is the perfect way to find out what it’s all about. Taking responsibility for our own lives, is realizing that we create our own realities. We invite you to create a beautiful and fulfilled reality during your time here at Taino Farm to take a piece home with you. Please contact us for more information and to begin your application process.